When it comes to golf, even the tiniest parameter can affect the way you perform. While most golfers change their clubs as their skills improve, they often overlook the ball itself. Golf balls, while seemingly all the same, have varying compression ratings. A subtle change in compression can make all the difference on the course. If you’re not exactly sure why compression is important in the game of golf, you’re not alone. Many golfers don’t give the compression rating of their golf ball a second thought while others meticulously test their swing and performance. If you’re looking to find a golf ball that’ll work with your playing style, compression is an important consideration. Basically, compression is all about the transfer of energy to the ball as you hit it. When your golf club makes contact with the ball, it’s flattened by the impact. While golf balls seem solid and hard, they are designed to compress. The act of compression allows the ball to handle the force of impact from the club. It actually absorbs the energy created from the swing. This transferred energy makes the ball travel a far distance while ensuring that it doesn’t shatter upon impact. The way a ball compresses is directly related to how dense it is. The lower the density, the more it can compress and recoil. It’s common for newer players to go with a lower compression rating, as they can achieve more distance and loft. Compression ratings range from 70 to 110. Ratings on the lower end of the spectrum allow newer or younger players to even out the competition with someone that’s more experience. That being said, lower compression rating balls can be difficult to control. Seasoned players often go with ratings at 90 or above. They must hit the ball much harder to achieve far distances. However, high rated balls are denser and easy to control. This makes them highly desired by pro players. While most players stick to a type of ball they are comfortable playing with, it’s a good idea to switch out balls in different situations. A ball’s compression can be used to your advantage in certain situations. One of the most common reasons to go with a different rating is the weather. In cold environments, a ball with a high compression rating can feel like you are striking something solid and heavy. Not only will this throw off your game, but it can be uncomfortable. A low-density ball will make up for the effects of the cold and provide better distance. Which Golf Ball Compression is Right For You? Choosing the right compression rating is important. Not only will it make the game more comfortable to play, but you’ll see more success. While other factors of the ball can affect your game, many manufacturers make compression rating a top consideration. When choosing a ball, you should consider the way you play. Your strength, control, and speed should be used to make a decision. How you approach the game is also important. For most players, driving distance is key. However, others prefer control over distance. Before buying the first pack of golf balls you see, take notice of how you play and measure your swing with a golf analyzer. If you swing at high speeds above 105 MPH, you don’t really need help getting across the course. With a powerful swing, you should consider going with a denser ball that will provide you with control. Sure, a ball with low compression may get you even further, but it will most likely also cause you to lose your ball. Balls with a compression rating of around 80 are perfect for those who swing between 85 – 104 MPH. 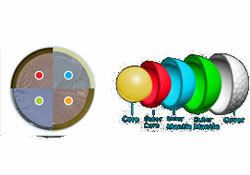 Mid compression balls offer a balance of control and distance. It’s also a great option for those wanting to improve their game and achieve distance on their own. If your swing measures below 85 MPH, a low compression ball is the way to go. At this low speed, it’s important to get as much distance as possible. Control usually isn’t an issue, so it’s a good idea to find a ball with a rating that will improve driving distance as much as possible. Golf Clubs (Sets) for Beginners: Which Ones are Best? Golf Nutrition: What to Eat Before, During & After Playing?